ExcelSafe allows users to secure spreadsheet data with electronic signatures. The user selects a blank cell and enters their user ID, password, and the meaning of the electronic signature. Once the user confirms the decision to apply the signature, the spreadsheet is locked from further editing. Add Electronic Signatures to any cell in any spreadsheet within your program. Spreadsheets are locked and cannot be modified with an electronic signature applied. Removing the electronic signature allows the spreadsheet to be edited. Adding or removing an electronic signature is recorded on the audit trail. The ability for a user to add or remove an electronic signature can be determined by security group or customized for individual spreadsheets. 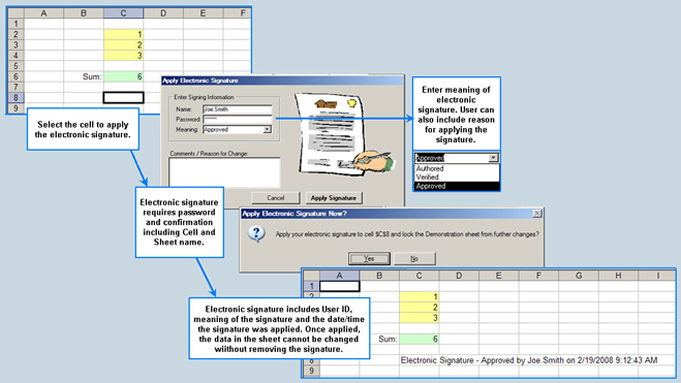 Multiple electronic signatures can be applied to a single spreadsheet. Electronic signatures cannot obscure or overwrite previously entered information.